Nokukhanya Bhengu was born at the Umngeni American Board (Congregationalist) Mission on 3 March 1904. Her paternal grandfather, Ndlokolo Bhengu, was the chief of the Ngcolosi people. Her father, Nokukhanya_BenguMaphitha Bhengu was one of the early converts of the Umngeni Congregationalist Mission. Nokukhanya began her schooling at the Ohlange Institute in Inanda in 1913 and was an outstanding student. One of the teachers at Inanda Seminary recommended her to Adams College for a teachers training course. During this time in South Africa, there were very few opportunities for black people to develop their skills. Teaching, Nursing and clerical opportunities were among the few popular career options. Nokukhanya enrolled at Adams College in 1920 and did a two-year teachers’ training course. 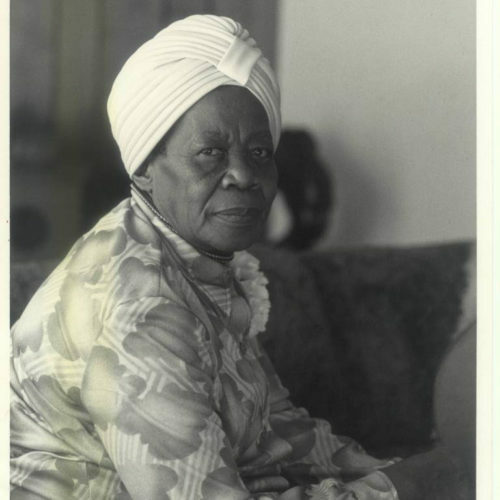 In 1922 she began to teach at Mpushini near Pietermaritzburg. Later that year she taught at Inanda day school. In 1923 she was invited to stand in for a teacher at Adams College, who had gone overseas. This also gave her the opportunity to take her higher teachers diploma. It was at this time that she met Albert Luthuli who was her teacher for Zulu and School Organisation. In 1925 Nokukhanya was asked to teach at Adams College and while she did this, she resided at the school hostel. It was in this year, that Albert Luthuli began to court her. Two years later, in 1927 Nokukhanya and Albert were married. Initially they lived in the house of Albert’s uncle, Martin Luthuli, while their house was being built in Groutville. Nokukhanya gave up her teaching career after her marriage to Albert Luthuli, to help with looking after Albert Luthuli’s ailing mother. They later moved into their own house in 1928. Between 1929 and 1945 Nokukhanya bore Albert Luthuli seven children (three boys and four girls). Nokukhanya was an excellent farmer and grew vegetables, sugar cane and fruits. She supplemented the family income through her farming activities during the time that Albert Luthuli became Chief of Groutville and especially in later years when political activities demanded much of Chief Luthuli’s time and efforts. Nokukhanya was such a hard worker that other farmers in Groutville used to look to her for the time to wake up in the morning – “There goes MaBhengu. The fields are calling us”, they would say. Nokukhanya made her children’s’ clothes on a Pfaff hand sewing machine, with the assistance of Charlotte (Chief Luthuli’s cousin who lived with them). She was also active in the community and set up a post office at her home for Groutville residents. At one stage she rallied the women of Groutville and led a movement for the establishment of a local clinic. She was a founding member of the Groutville branch of ‘Daughters of Africa’, which was the forerunner to the ANC Women’s League. Furthermore, she was part of a delegation to the Zulu King to complain about the extension of passes to women. She was also elected as a delegate from Groutville to the ANC national conference in Bloemfontein in 1955. In December 1961 Nokukhanya traveled with Chief Albert Luthuli to Oslo where he was to be awarded the Nobel Peace Prize. Chief Albert Luthuli greatly respected Nokukhanya and her values. He acknowledged her role during his Nobel Peace Prize acceptance speech and stated that she richly deserved to share the honour of receiving the prize with him. 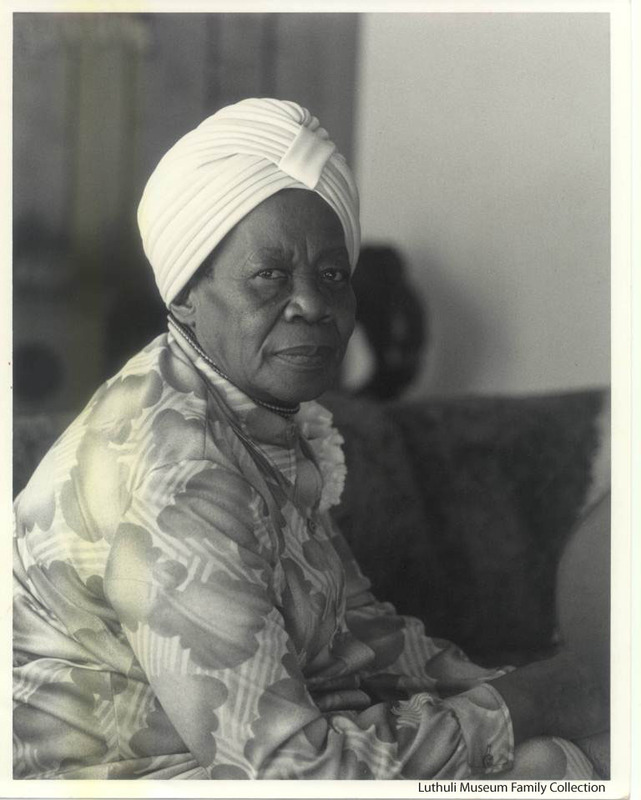 After the death of Chief Albert Luthuli in 1967, Nokukhanya remained active and busy, taking an interest in what was happening within her community, supervising work in the fields, settling worker disputes and visiting relatives. Nokukhanya accepted her new position as a widow. She never traded on Chief Luthuli’s name, or asked for favours; instead she took full responsibility for all unfolding matters. Nokukhanya passed away in 1996 at the ripe old age of 92. She is buried at the Congregational Church in Groutville and her graveside is beside that of her late husband, Chief Albert Luthuli.